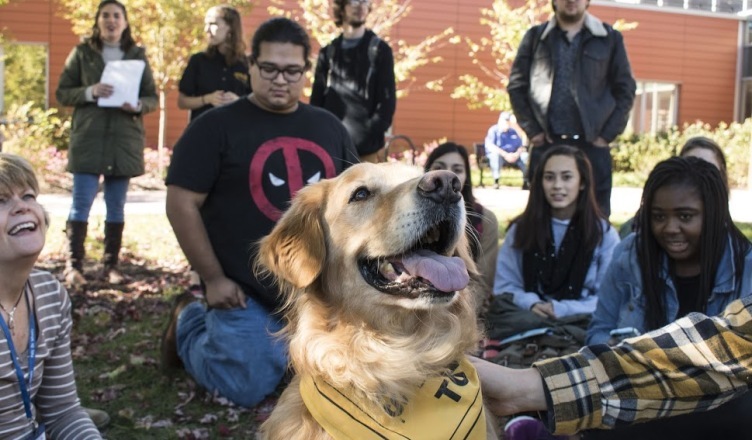 Oct. 17 could’ve been the best day of your week if you’re a dog person, because for two hours there were therapy dogs on campus. The Towerlight got some photos of these precious pups, brought to the front lawn of the Health and Counseling Center at Ward & West by the Healthy Minds Peer Educators for an event called Paws to Relax. Three sweet dogs, Chester, E.O. and Lovie, shared the love with students who needed a reprieve from the stress of midterms. E.O. stretches his neck as he gets just the right spot scratched by a student. E.O. is a sweet beagle mix who wanted to spread as much love as possible. Chester is seven years old, but that didn’t stop him from acting like a puppy, running around and spreading the love to everyone! This sweetie, Lovie, was content to be passed from one person’s arms to the next. Sitting around this high-energy, happy boy seemed like a good solution to spread maximum love and affection. A few students finally got Chester to stand still long enough for a photo! Chester was all about running back and forth between different students, even running into some if he got too excited! E.O. was happy to jump up, lean against and smile at anyone who came over to him.